How about a FREE! stick poster anyone? $10 a poster as always~ There's a shiny pearl and a normal version of each~ Make your reservations!!! Coming at the end of October. 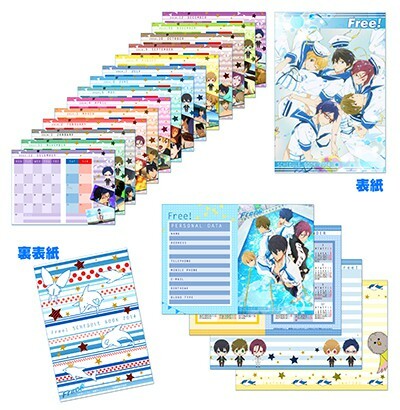 Does anybody want a FREE! 2014 Schedule Book? The Schedule book contains 48 pages, with different artwork for every month, notes, full year calendar, and a plastic cover. Schedule Book will be $24. I could order only 3 books, now completely SOLD OUT, first come first served!! Let me know as soon as possible~ Will most likely be available to ship at the end of October. These figures are KILLER CUTE!!! I WANT THEM ALL!!! How much would postage be for the schedule book? Can it be sent oversized letter mail, airmail (NO tracking) to Canada? Was it a MOVIC at animate item? Oh no, prize draw goods too... gah. Yup, the schedule books are always made by movic, usually they have a lot of anime schedule books, I dunno why they've only posted KuroBasu, Free, Gintama and Attack on Titans on the Movic website, not on Animate... Either way, they're all sold out for preorders, maybe Animate will carry them after their actual release date on the 10th of October. 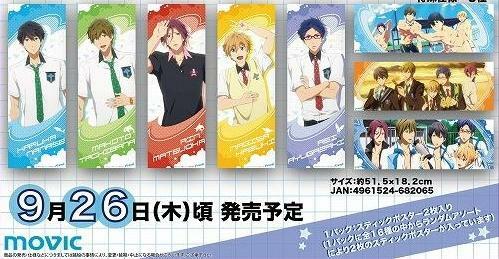 Yeah the anikuji goods, they are so cute and hard to complete the whole collection!!! Hello, count me in for a schedule book please :). I would like a Makoto and a Haru accessory. If there is enough interest to order a stick poster box, I'd like the swimming jersey shiny version. Thank you! And awwwwww the figures are cute! Okay, I'll put you down for those two accessories, I will order on 9/27 and will let you know if it's successful! There's still a schedule boom available for you!! And I will put you down for the stick posters as well =) Yeah, those figures are really cute huh? I'm looking forward to seeing all of the items in those series of Anikuji!! Hello, the swimming jersey shiny version is already reserved. There's still a normal version. Do you want that instead? They are not available yet, so I won't be asking for payment until I have put the order through. Where are you located? Let me know so I can talk to you about shipping.